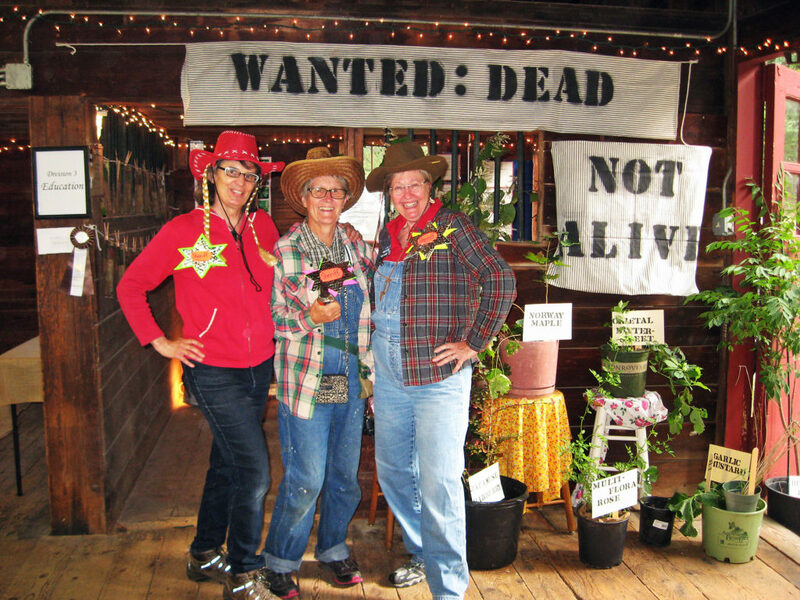 WANTED: DEAD NOT ALIVE received an Educational Excellence award at the Sharon Garden Club’s September Garden Medley on September 9, 2017. The exhibit featured potted exotic invasive plants and illustrated some of the environmental damage they cause. Left to right are Carol Lundeen of Easton and Brenda Minihan and Ellen Schoenfeld-Beeks of Sharon. 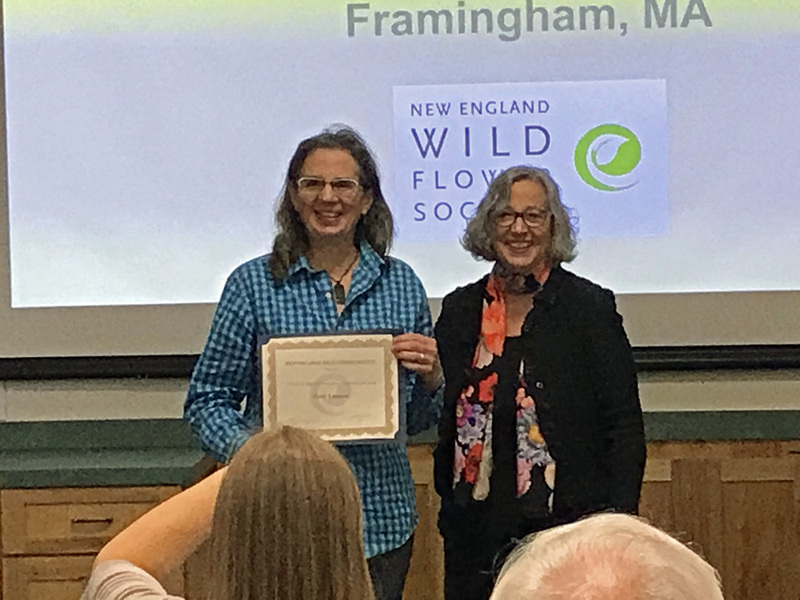 The trio played roles as invasive plant sheriffs, engaging visitors in conversation and offering invasive plant checklists, images, and ideas for native plant alternatives. Photo by Carol Lundeen. WANTED: DEAD NOT ALIVE received an Educational Excellence award at the Sharon Garden Club’s September Garden Medley on September 9, 2017. The exhibit featured potted exotic invasive plants and illustrated some of the environmental damage that invasives cause. 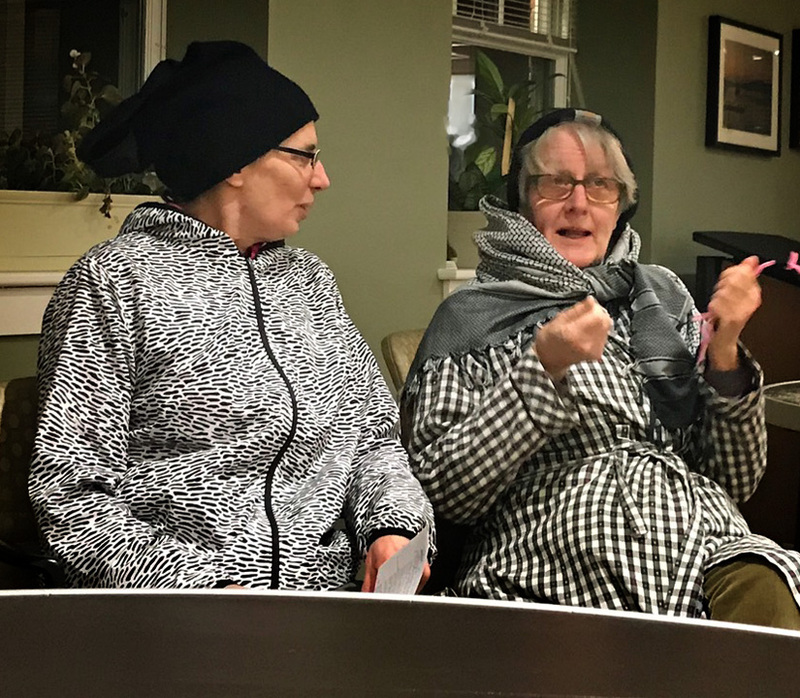 Carol Lundeen of Easton and Brenda Minihan and Ellen Schoenfeld-Beeks of Sharon played roles as invasive plant sheriffs, engaging visitors in conversation and offering invasive plant checklists, images, and ideas for native plant alternatives. Exotic invasive plants have no natural predators and diseases that would naturally control their growth. Some invasive plants have escaped from our home gardens and public plantings into natural areas and cause profound environmental and economic damage. Massachusetts has developed a list of problematic plants. Some are even illegal to sell, including Norway maple, Japanese maple, burning bush, all hollow-stemmed honeysuckles, garlic mustard, oriental bittersweet, and Japanese knotweed. The exhibit also included a “Talking Tree,” a young pin oak tree that posed the question, “When I turn one hundred years old, what do you hope I will say?” Visitors then wrote their answers on a card and tied their card to the tree with yarn. The tree will be planted at the Unitarian Universalist Church in the center of Sharon. The sheriffs urge folks to learn about the species considered invasive in the area, generate a list of those on your property or in your town, create a plan for eliminating them, and execute your plan. 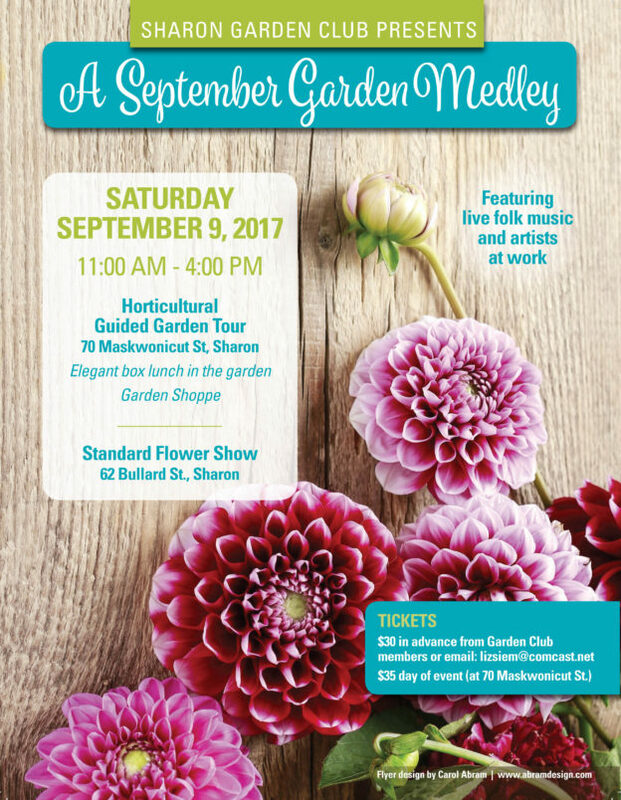 Contact the Sharon Garden Club or Carol Lundeen for further information. This entry was posted in Carol's List of Bad Plants, Community Service, Exotic invasive plants, Garden events, Gardening events, Horticulture, Invasive plants, Native Plants, Sharon Garden Club, Sharon MA, Talking Tree, Trees, WANTED: DEAD NOT ALIVE and tagged award, education, exotic, flower show, Garden Club, gardens, horticultural excellence, invasive plants, Native plants, Sharon MA, Talking Tree, Wanted: Dead Not Alive, winning on September 12, 2017 by admin. Why Are My Rhododendron Branches Dying? 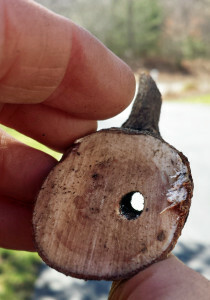 Cross-section of a rhododendron branch with a hole in it. A Rhododendron borer has tunneled all the way through this branch, and the branch is dead. Could it be rhododendron borers? I started spring pruning for an organic gardening client in Sharon last week, on one of those yummy sunny 60 degree March days. 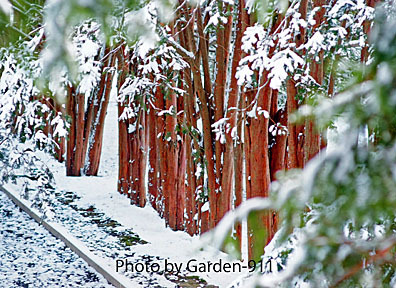 Near her front door are broadleaf evergreen shrub beds on either side of an elegant entry path. 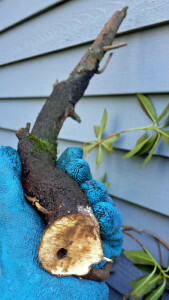 My goals were to prune out any dead, use selective pruning to open up dense areas and stimulate new growth for a more balanced and pleasing form of individual shrubs and their big picture impact, and scout for pests. A dead branch on a rhododendron caught my eye. I’m always very curious about why plants and their parts fail to thrive, so I investigated a bit. I cut off a portion of the dead branch and in its cross section found a dead giveaway of a clue. It looked like an electric drill had made a 3/16 to 1/4 inch diameter hole in the interior of the stem, parallel to the length of the stem, and I knew right away it was quite likely the work of a rhododendron borer. I kept cutting the branch closer and closer to the ground, and found that the borer hole went all the way down to where the stem met the root flare at soil level. It may be that a second year borer spent some time in the roots, then bored its way toward the tip of this branch, contributing to its demise. I’ll continue to watch carefully for signs of activity and damage, and remember that borers are just one of several flavors of rhododendron pests. This dead rhododendron branch shows a tunnel entrance created by a rhododendron borer in Sharon, MA. How do you treat something like borers? 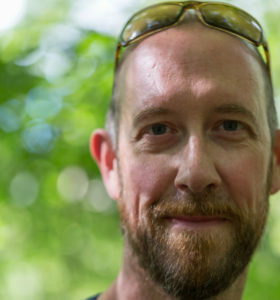 Try the following methods, or contact me when you see damage and you need help gathering evidence and deciding how or whether to save your valued shrubs and trees. Look around for dead branches and cut a cross section of one. Look for other signs such as a borer’s exit hole through the branch, frass (insect poop that resembles sawdust), and the condition of the leaves and stems. Photography these signs for your records. Cut out and destroy all affected tissue – or save a sample to send to a lab. Whether there’s an effective pesticide for the two types of Rhododendron borers seems to depend on what extension service or licensed pesticide professional you ask, and in any case monitoring and prevention are the best next steps. This is an organic client who prefers organic treatments for the health of her family and the environment. An injection of nematodes into the stems may be appropriate if she has the stem borer. I’m looking into it. Keep mulch at least 2-3 inches away from the base of of all plants where the stems meet the earth, including rhododendrons. Your mulch should never be more that 3 inches deep. Keep shrubs well watered during dry periods. One inch of water per week is generally sufficient for established, healthy plants. More water than this is usually needed for plant establishment. 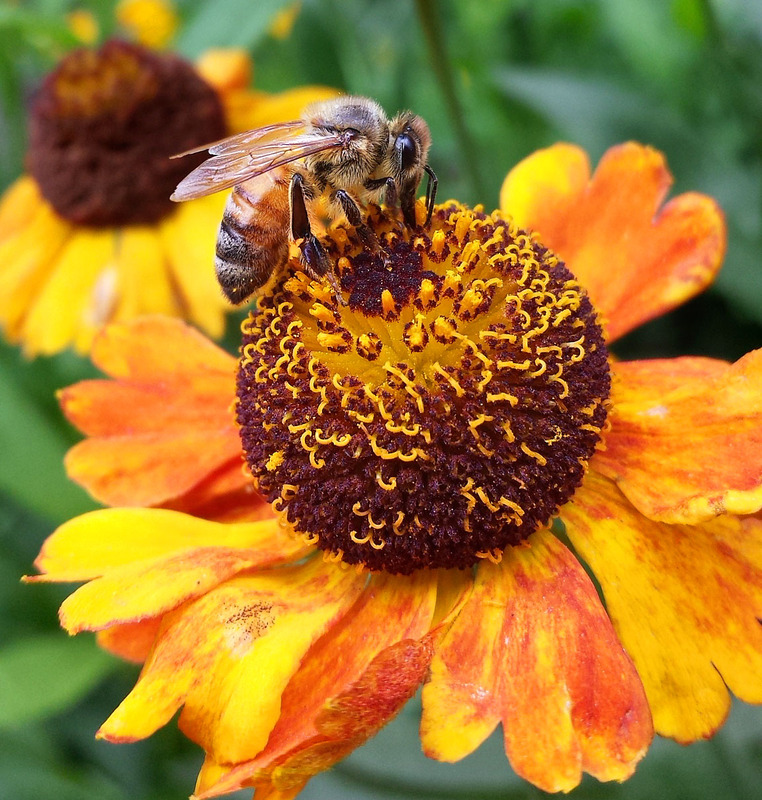 Avoid wounding shrubs, as wounds can make it easier for insects and pathogens to enter. If your plants have any branches that directly cross one other, they probably rub against each other when it’s windy, causing abrasion damage and creating entry points for pests and pathogens. Also, do not wound shrubs with lawn mowers and string trimmers. If you don’t have an edged bed around a tree or shrub, make one large enough so that not only will your string trimmer no longer nick the trunk, but the mower won’t run over the root zone. A general guide is to edge out a bed that goes all the way to the drip line, defined as the area all the way from the trunk to the outermost circumference of the tree’s canopy . After cutting out and removing any lawn or weeds, etc. 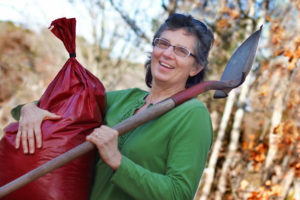 from your edged area, apply 2-3 inches of mulch to the bare soil. Not all damage to rhododendrons is from borers. There are plenty more causes as well. So be careful, don’t jump to conclusions, get a positive ID, and get help if you’re not sure. 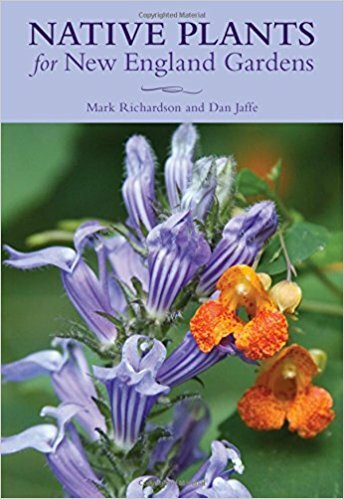 This entry was posted in Drought, Fine Organic Gardening, Horticulture, Insect Pests and Pathogens, Mulch, Organic lawn and land care, Sharon MA and tagged borers, gardening, mulching, organic, plant damage, plant insects, pruning, Rhododendron borer, Rhododendrons, Sharon MA, spring on March 15, 2017 by admin.